The saying ‘your first impression is the last impression’ works almost in the entire situation simply because we generally make our perception of the person in the first few minutes of meeting them, the way they dressed up, the way they talk and every detail that is visible in the first look leave a long lasting impression. When you meet someone the first thing you do is to introduce yourself whether it is a formal meeting or a personal and in this world of globalization, you need a good command of your English to fit in the world, to introduce yourself in English confidently especially if you are giving an introduction to your interview. English speaking doesn’t come easily to everyone; there are people out there who are the master of their world, but lack in the field of confidence when it comes to speaking in the English. Now we are going to discuss few tips on introducing yourself in English. 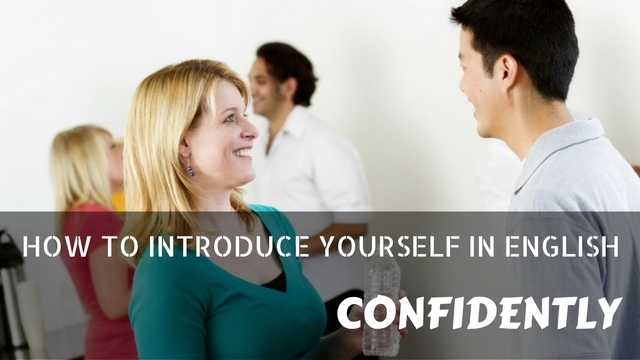 Here in this article, we are going to discuss how to introduce yourself in English confidently. Read this article if you feel out of place just because your confidence is lacking by the simple thought of speaking in English. When we talk about the introduction in fluent English people often got scared just by the name of it because of their command over the language. They thought they cannot speak well in English because they don’t know the rules, grammar, and other stuff about the language and that will force them to make mistakes, that they don’t want. The thing most people forget, especially those people who are scared of English that the introduction is just a few lines where you do not need to pull the whole grammar to make the sentence, even the lines of the introduction are the simplest sentences of the English. They just make mistakes because of their fears, not because they are any less talented or something. how to introduce yourself in English confidently? The answer lies within our fears, but here we are going to discuss how to introduce in English about yourself confidently. Lack of confidence is one of the reasons why we hesitate in giving the introduction in the first place, but the situation really got a bit tough if our English is not up to the mark. Most of the cases include lack of confidence rather than lack of understanding of English, we fear we will do something stupid or say something which will look bad later on. The fact is our confidence can do wonders even if we are not good at something and this applies to giving introduction too. You don’t need fluent English to introduce yourself or to form correct sentences that are used in the introduction. You know deep inside that you can easily do that, then why you are hesitating? Why the fear of rejection when you have done nothing wrong. Remember your confidence is your biggest friend that never leaves you hanging so believe yourself and trust in your abilities that you can do that. You are confident you can do this, you prepare well before the introduction and then stay muted when you get the chance to introduce yourself then what is the benefit of all the confidence and preparation? You need to break the ice to start the conversation and what better than a ‘hello’ that followed by introducing yourself with your name. This is the most common way to break the ice and start the introduction. You can ask a small question like how you are and how was your day, etc. to keep the initial conversation going on. Breaking the ice means to get comfortable with someone and when you are comfortable you speak more confidently and clearly. Starting the conversation also gives you the benefit of asking questions and confidence boost up. The best thing about the introduction is that there are so many common questions you can ask to keep going the conversation and it also makes you look confident in yourself. The person who starts the conversation and ask few initial questions always have an upper hand in the introduction as well as it gives a boost to the confidence which is much needed if you are afraid giving an introduction because you think you are not good enough. You can ask about many things like living place, working life, occupation, etc. to keep the conversation easy and simple. To ask the questions you can pick the topic that is currently happening around you, that way you can stir the conversation more confidently, and have more to talk about as well as it will keep the conversation on comfortable ground. If you have a habit of ignoring what the other is saying then this is the high time you should correct this habit of yours because this habit can cause you really uncomfortable situation, especially when you are trying to talk about yourself in English with confidence. When you listen your opponent while introducing yourself, you get the better hang of the situation and how the other one is taking the introduction. It also helps you in formulating your response and the question you are going to ask. Never make the mistake of ignoring the answers as it not only give the wrong impression but also make you look like an arrogant person who doesn’t care about the conversation. Listen carefully, answer and then proceed to the next question. It is always good to prepare yourself beforehand. If you know you are going to face the introduction phase and know the person who is going to be on the opposite side then prepare your answer and question beforehand. You cannot predict exact question and answers, especially in the situation like interviews, but you can prepare your mind. Give yourself a pep talk before the introduction and do some breathing exercise that helps in calming your nerves and improve your confidence level. Practicing some questions and answers beforehand helps you in preparing your mind which will have a hard time if you don’t know what you are doing and how you are going to face the situation. Precautions are better than cure, so prepare yourself beforehand and remember you cannot predict everything. It is common occurrence that you feel you don’t have anything to ask, but leaving an awkward gap between a conversation to make your whole conversation seems uncomfortable and awkward. When you feel you don’t have anything to ask, politely ask for something else, something less of awkward and that can stir your conversation to a more comfortable level. You can ask about common topics like occupation, hobbies, and other similar conversation. If you are having a conversation in an interview, then you can ask about the company and the job you are giving an interview for and if the conversation is less of formal then you can move on to the less of formal topics. Do not ask a complicated question that needs to be detailed or the answer leads to controversial topics. Have you ever thought what makes you most uncomfortable about the introduction in fluent English? Maybe you know or maybe not, but mostly it is the thought of making mistakes that keep you from making any efforts. When you have to introduce self in English confidently, then stick to the simple and easy sentences. The conversations you generally have in an introduction involve sharing of common information about you that can be easily shared in simple sentences. Use simple past tense to shared past events and do not try to deepen your answer with complicated phrases because it will make you trip over the words or you may feel out of the box in sentence formation. Simple sentences are easy to form and you do not need to think hard about it as well as when you answer positively to a question you feel more confident even if your English is not that good. You know your words are not just the only thing that voices your answer, your body language, and a gesture speaks volume, sometimes even more than your words. When you have to introduce in English yourself confidently, stick to normal hand gestures and body language, do not make nervous gestures because when you start making nervous gestures your mind loses focus of the main concept and concentrates on your own. Actually, nervous gestures are the way the body deals with the nervousness, but you need more self-control and confidence before you start speaking because you don’t want to give wrong signals from your hand and body language. If possible use gestures that contribute to your conversation and help you in better explaining what you are saying. Again, you need to be confident in your abilities, that you can do this, there is no rocket science involved in it. Our mind is our biggest support and worst enemy, we don’t need someone else to make or break a situation, our own mind is perfectly able to do that, sometimes unconsciously and sometimes due to the lack of confidence. Be sure of yourself and of your abilities because your confidence is what makes you form sentences, even when you are no master of the language. Smile while having a conversation because a simple, light smile can make the environment less of tense and strict as well as increases your comfort level in the situation. There are few things you can think beforehand or on the spot, both depends on the situation before, there is no way you can predict the situation before it actually happens. You can do some prediction depends on the person you are going to introduce yourself, but there is no sure way to predict the exact situation so what better to do? The best thing is preparing your exit plan beforehand. No matter the situation you always need an exit plan to end the conversation and that too on the positive note where there are chances of a positive outcome. You can politely excuse you with a small smile or ask for a break sweetly, without creating the awkward vibes around you. There are always things you say or do wrong that have a negative impact on your introduction that you are trying hard to do without a hitch. Here we are giving a list of the things you should avoid while introducing yourself because you don’t want your introduction to go down the hill before it even starts. 1. Try and avoid long sentences as they make you trip over your own words and makes you uncomfortable. 2. Don’t try too hard to use tenses, just follow simple past, present, and future tenses to deliver your answer. Complicated sentences only create more problem for you to keep the conversation flowing. 3. Don’t do gestures that speak more than you like loudly tapping your foot, using your mobile phone, again and again, are the type of gestures that gives the wrong signals. 4. Never be too hard on yourself and remember English is just the language and you can do it, whether you are an expert in English or not. Giving your introduction in English is a trouble for majority of people, especially those who have a hard time dealing with the English and it often leads to uncomfortable, fruitless introductions. Here are a few simple tips and tricks you can use to overcome hesitation and sail your boat smoothly even when you are no expert because simply you need a good fluent introduction to leave a good first impression.